"Fifteen-year-old Julien Losier just wants to fit in. But after his family moves to a small village in central France in hopes of outrunning the Nazis, he is suddenly faced with bigger challenges than the taunting of local teens. Nina Krenkel left her country to obey her father's dying command: Take your brother and leave Austria. Burn your papers. Tell no one you are Jews. Alone and on the run, she arrives in Tanieux, France, dangerously ill and in despair. Thrown together by the chaos of war, Julien begins to feel the terrible weight of the looming conflict and Nina fights to survive. As France falls to the Nazis, Julien struggles with doing what is right, even if it is not enough - and wonders whether or not he really can save Nina from almost certain death. Based on the true story of the town of Le Chambon - the only French town honored by Israel for rescuing Jews from the Holocaust - How Huge the Night is a compelling, coming-of-age drama that will keep teens turning the pages as it teaches them about a fascinating period of history and inspires them to think more deeply about their everyday choices." "Heather Munn was born in Northern Ireland and grew up in southern France where her parents were missionaries like their parents before them. She has a BA in literature from Wheaton College and now lives in a Christian intentional community in rural Illinois, where she and her husband, Paul, host free spiritual retreats for the poor, especially those transitioning out of homelessness or addiction. When not writing or hosting, she works on the communal farm. Lydia Munn, daughter of missionary parents, grew up in Brazil. She received a BA in literature from Wheaton College, and an MA in Bible from Columbia Graduate School of Bible and Missions. With her husband, Jim, she has worked in church planting and Bible teaching since 1983, notably in St. Etienne, near the small town in the central mountains of France which forms the background of How Huge the Night. The Munns now live in Grenoble, France." Kregel Publications is sponsoring a $50 Amazon.com giveaway! If you tweet they'll capture your entry when you use the hashtag (#litfuse). If you share it on Facebook or your blog, just email them to let them know (info@litfusegroup.com). Feel free to use the following retweet button - click where it says "tweet", not on the number bubble and make sure it's linking directly to this page. How Huge the Night by Heather & Lydia Munn is a compelling, coming-of-age drama that will keep teens and adults alike turning the pages late into the night! How Huge the Night is a fantastic book. It brought tears to my eyes more than once. The book recalls the heroism of what Jews call "Righteous Gentiles." Righteous Gentiles are the non-Jews who took their own lives in their hands to protect and save Jews during the Holocaust. There's even a section in Yad VaShem, the Israeli Holocaust memorial, dedicated to these Righteous Gentiles. Julien, one of the main characters, learns to care more about others and realizes that everyone has good in them. His growth throughout the book is compelling, making the reader more likely to learn his lessons along with him. By the end of the book you too will understand the goodness in others, no matter how much you may "hate" them. Nina and Gustav, two of the other main characters, both show an incredible amount of bravery and persevere even when it seems as though all is lost. Gustav's dedication to his sister's welfare is very touching. The book's narration and plot are easy to follow, even with the relatively large cast of characters. How Huge the Night is a great read for anyone with an interest in World War II, the Holocaust, and Righteous Gentiles. Even though the main characters are all teenagers, you don't need to be a teenager to enjoy the book. Overall: We give How Huge the Night a 10/10! This giveaway will close on June 2, 2011 at midnight. 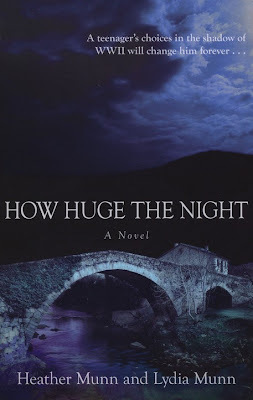 We received a copy of "How Huge The Night" in conjunction with Litfuse Blog Tours free of charge for the sole purpose of this review; no other compensation was received. All opinions expressed are my own. survived or perished in the Nazi Death Camps during the Holocaust but Im sure they would have stories to tell. I don't know anyone, but it is an interesting & sad subject. I don't know anyone either but love hearing stories! Entered Prefense Hand Sanitizer giveaway! I don't know anyone personally ! I don't know anybody who survived a death camp. When I was 14 I visited the former concentration camp Buchenwald in Germany. It's now open to the public and it was one all the exhibitions about the cruelty of the nzis made such a huge impact on me.